The University of Tokyo and France’s geological survey, BRGM, signed an agreement on October 2, 2017, to enhance their scientific cooperation to help reduce and manage disaster risks through the imaging technique known as muography, that works like X-ray but uses elementary particles originated from outer space called muons to penetrate massive objects spanning several hundred meters, providing tools to investigate the inside of volcanoes, caves, and landslides, among other natural phenomena and manmade structures. France’s Higher Education, Research and Innovation Minister Frédérique Vidal, who attended the signing ceremony at the French Embassy in Tokyo, expressed her high expectations for disciplinary diversity in muographic research to foster personnel exchanges between France and Japan. 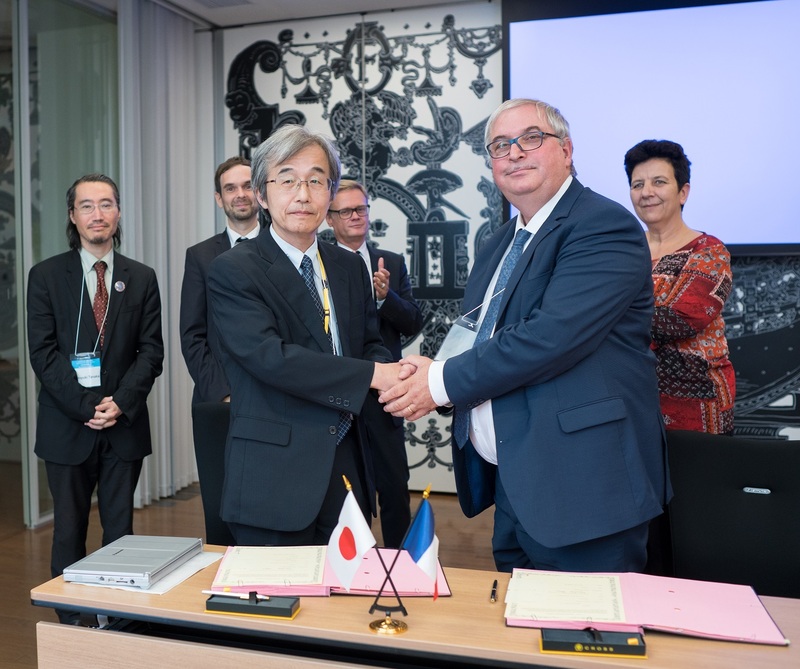 The memorandum of understanding between the University of Tokyo’s Earthquake Research Institute (ERI) and the French government agency was signed by ERI Director Kazushige Obara and BRGM Deputy CEO Pierre Toulhoat. The signing followed the Muographers 2017 general assembly, a full day of presentations by Japanese and European scientists on the uses of muography to gain insights on difficult-to-access structures, organized by the ERI and other Japanese and European institutions. A separate symposium highlighting the Japan-France cooperation on disaster risk reduction was held concurrently. The events kicked off the French-Japanese Week on Disaster Risk Reduction organized by the French Embassy.